I cannot believe it is now 2015!!! 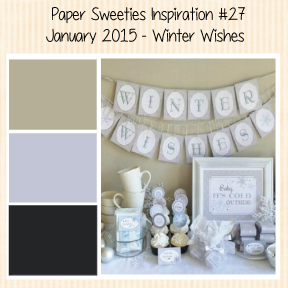 Inspiration Challenge here at Paper Sweeties! What a fabulous inspiration photo! The snowflakes and the colors are what inspired me with this card. I decided to use several different stamp sets on this card. Because this is a Winter Wishes theme, I decided to use snowflakes. I die cut a large heart with white card stock. I stamped the heart with the larger snowflake from the set Holly Days with Versamark Ink and heat set it with Sand embossing powder. Next I used the smaller snowflake from this set, and heat embossed with silver. The dots are from the Snow Time stamp set, and they were heat embossed in black . I applied Pumice Stone Distress ink onto my craft pad, spritzed with water and dabbed the embossed heart into it. All of the embossed areas resisted the Distress ink. I stamped the sentiment on Vellum paper and heat embossed with black. The sentiment is from the retired Paper Sweeties Snowman/Winter stamp set. I stamped some hearts from the Be Happy stamp set with silver ink in the corners. I decided to fran-tage the other corners. I added some sequins and then mounted everything on a Black glitter panel. This card is very shiny IRL which I thought was appropriate for celebrating the new year!! Now please go visit my Paper Sweeties Teamies! And welcome our newest teamie...Jill Norwood! You will be totally inspired! And I hope you will join us! Gorgeous Mackie!!! LOVE the splatters!! Happy New Years!! Gorgeous background! Beautiful snowflakes, too! Happy New Year to you and family! This is beautiful! LOVING the splatters and the heart!!!! Mackie I love this card so much!!!! You always inspire me!!!! What a perfect card for the new year!!!! Thanks for the shout out my dear!!! And Happy New Year!!! This card is AMAZING ... WOW! So much detail and so many gorgeous techniques!!!! Beautifully done Mackie, love the depth!! Happy New Year! Amazing detail, Mackie! I love the splatter technique! Happy New Year Mackie. Love the collage look of this card along with the oh, so popular metallic colors. Fantastic design. So beautiful Mackie! Love the artsy vibe! The splashes of ink look fantastic! Happy New Year to you and your family! Oh wow! Such fantastic texture! You just want to run your fingers across it. Beautifully done! Paper Sweeties January Release Rewind! Paper Sweeties January Release Day!